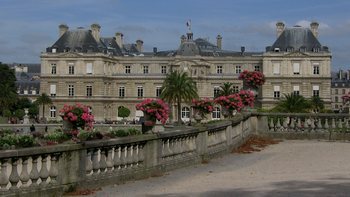 Unlike other Paris parks, the Luxembourg Gardens are operated by the Senat, which occupies the Luxembourg Palace. They may be a bunch of politicians, but those senators know how to operate a superb park. The Lycée Montaigne, facing the Luxembourg Gardens. 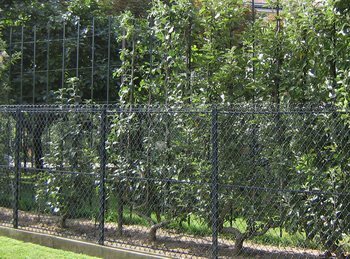 Espaliered fruit trees are kept behind a fence in the southern end of the Luxembourg Gardens. Here’s the beekeeper in the apiary of the Luxembourg. We are warned not to step on the grass here – Danger Bees! 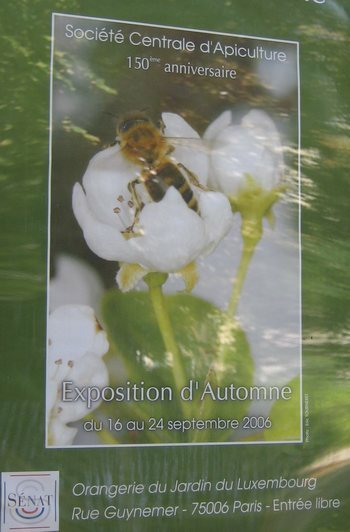 To celebrate their 150th anniversary, the Central Apiculture Society is having a Fall exhibition from Sept. 16 to 24 at the Orangerie of the Luxembourg Gardens. The honey collected from the “rucher-ecole” (beekeeping school) in the Luxembourg is sold each Fall at this exhibition. We’ve been exploring the Luxembourg Gardens, our new “back yard,” so you will be seeing many photos from there. The gardens, once upon a time, were much larger. One of the structures now occupying space that was formerly part of the gardens (specifically, part of the Chartreux, an order that grew fruits and vegetables) is an enormous school called Lycée Montaigne. It has 700 junior high school students and nearly 1200 high school students. 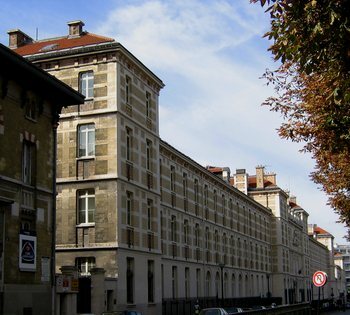 There are other large schools nearby, too, including the Lycée Saint Louis, which is close to our apartment, down at the beginning of rue Vaugirard. At lunchtime, evidently, they let the kids out to roam for a couple hours, so they swamp the park and the nearby grocery stores like Franprix. They fill up the Franprix, but each student buys only a couple or a few little items for his or her lunch. On Wednesday afternoons, the kids don’t go to school at all. But they have to go to school on Saturday mornings. Lycée Montaigne’s program is one of “classical education.” I think that means college prep, and not vocational. The school first opened in 1885. The two world wars interrupted its operations somewhat. At the end of World War I, the school was turned into a hospital for American soldiers. During the “occupation” of World War II, the soldiers of the “Luftwaffe” were housed there. During these periods, the school’s classes were held in various other facilities in the neighborhood. But the Chartreaux were not superstitious. They established magnificent fruit and vegetable gardens, including orchards of espaliered fruit trees, that became part of the Luxembourg Gardens. Today this “verger” tradition continues, and there is a school of horticulture operated there. Two tons of fruit are harvested from these gardens each year. 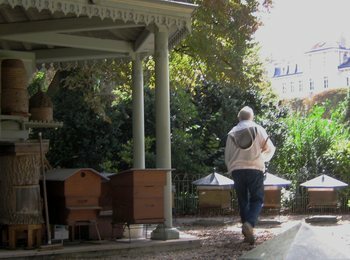 There is also an apiary in the Luxembourg gardens. The bees, of course, are needed for pollinating the fruit trees. We went out for dinner on Saturday night at peak time with no reservation. The area to the north of us is very busy with huge crowds and lots of restaurants – all full on Saturday. We wandered over to the brasserie Saint Benoit, however, and were given a superb table in an air conditioned dining room. Our server, a French man from Laos, was very friendly and talkative. Last night, we decided to leave the crowd behind and we walked over to Le Basilic in the 7th arrondissement. It was lovely. Tables are well-spaced, and service is superb. Tom had their specialty, leg of lamb with white beans, and I had the Chateaubriand. It was nice to have room to breathe and to have a quiet 20-minute walk each way.